Every year since I can remember bareMinerals has an Auto-Delivery kit at the holidays. I loved every shipment I received last year so I was quick to order this year's when the item number was available. I used bareMinerals a long time ago but the loose colors made such a mess. Now the loose colors have stoppers in the containers so I do not mind the Mineral Veil or the blush that come in this kit. Every since the "READY" products were introduced in to the line, I loved them. The quad eye shadows sell for around $30 so anytime I can get them in a kit I order it ASAP. I love these shadows. I am also very excited to try the Ready Luminizer. 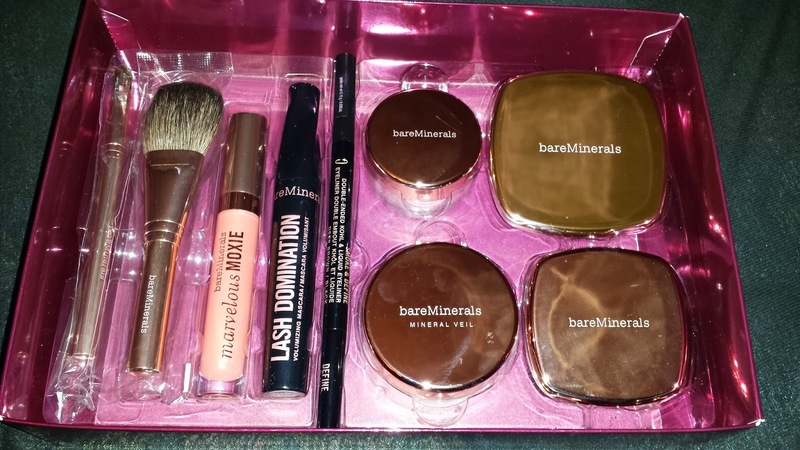 If you are interested in this kit, you can order it here: bareMinerals Glamour Now AD Kit. You can buy it now for the TSV price of $49.98 and it is also on 3 easy pays. If too many kits are pre-ordered, that link will either not work, or say it is sold out. If you are interested I would get it quickly! Once I use the items a few times I will follow up with a review!